Points Nécessaires : 58 Please note that, for now, you cannot download content from our platform directly onto a mobile device (phone, iPod, iPad, tablets...). You need to download your items onto a PC or Mac, and then transfer them onto your device in the normal way. We are working on allowing direct downloads to mobile devices but this is not possible in the current version of the platform. Sorry about the inconvenience! The second wildly funny tale about daring, adventure and friendship from the award-winning author of the Spy Dog series. 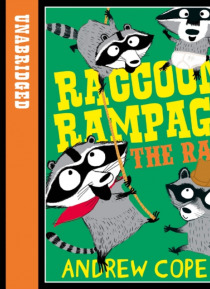 Part of HarperCollins' fantastic new Awesome Animals series - the funniest fiction, starring the wildest of wildlife, from leading authors The Hole-in-the-Tree gang are not happy when they find another group of raccoons raiding their favourite food stores. The town isn'… t big enough for the both of them but can Quickpaw Cassidy and friends come up with a plan to drive the raiders out? A brilliant adventure packed with laugh-out-loud-action.